Here is a small selection of great features available Ethos. 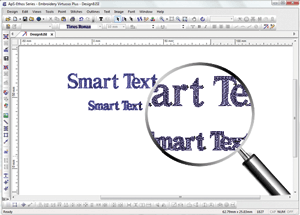 Smart Text is the embroidery industry's first intelligent text tool. Text is automatically adjusted to suit the size chosen. This feature goes beyond just adding pull compensation, it also opens up parts of a letter that might close in, like e's and a's and changes the underlay and density of the stitching. The AutoStitch Tool allows an image file or vector file to be loaded into the ApS-Ethos software and automatically converted to embroidery at the click of a button. Ai, eps and dxf files may be loaded into the software and automatically converted. There are also plug-ins so designs may be sent directly form Corel Draw and Adobe Illustrator. 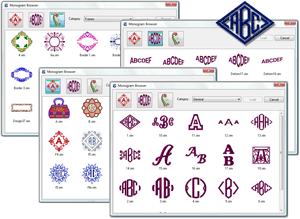 Monogram Plus contains a library of fancy multi colour and single colour monograms, as well as designs and lettering deforms. 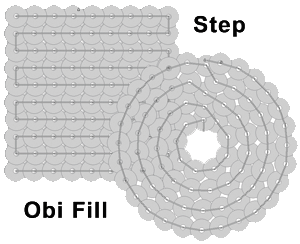 The sequin tool has been enhanced and is now compatible with the sequin attachment for the brother embroidery machines. In addition to the Running Line and Step Stitch Auto Reflect feature, it is now possible to use Reflect on satin stitch. 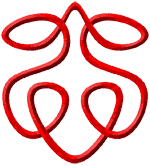 This ensures all your satin stitch shapes are perfectly symmetrical. When you edit a reflected point in version 11 there is an option to automatically adjust it's reflected point, keeping the object perfectly symmetrical.